Due to public interest, the final meeting of the Seven Dials Project stakeholders’ group is now open to the local community as a whole. The planners will present the results of the public consultation, there will be questions and answers, and Council Leader Jason Kitcat will attend, along with Cllr Ian Davey, who chairs the Council’s Transport Committee. It’s at St Luke’s Church on Monday December 17, from 7 to 8.30pm. The Prestonville Community Association welcomes the Seven Dials Project proposals: we believe they have the potential to create a safer junction, to make it easier for people on foot to use, and to improve the quality of the site as a public space. We look forward to seeing the proposals once they have been revised in the light of the public consultation, and to further constructive discussions with the Council about them. January may seem a long way off, but as we’re going to be discussing Hilary Mantell’s Wolf Hall, you may need a bit of notice! Or maybe you’ve read it already and will just need to refresh your memory? Although the group is functioning perfectly well with 6 or so members, we’ve been having such stimulating and enjoyable discussions over the past few months that we feel it’s a pity more people haven’t had the chance to share the experience. So, feel free to come along on Thursday, 17 January, 8.00pm, upstairs at the Chimney House. The next meeting will be on Thursday 22 November, 8.00pm, at 48 Stafford Road. Items on the agenda will include the protest outside Wiston’s Clinic, the proposed changes to Seven Dials, and the Big Freeze help-your-neighbour scheme. Friends of Dyke Road Park were so pleased by the two huge beds of different varieties of lavender, planted early last year, but it was a huge job keeping them weed free over last summer, and then a (not particularly cold) winter killed off the ‘fancier’ French varieties, leaving just the old-fashioned English ones in a curving lines across the beds. The Park Gardener, Steve Golds, suggested turning these two sloped beds into grassy banks with benches, and when this was put to a meeting of the Friends group there was unanimous agreement. We will still have some lavender bushes, but will be able to sit amongst them and enjoy the scent. 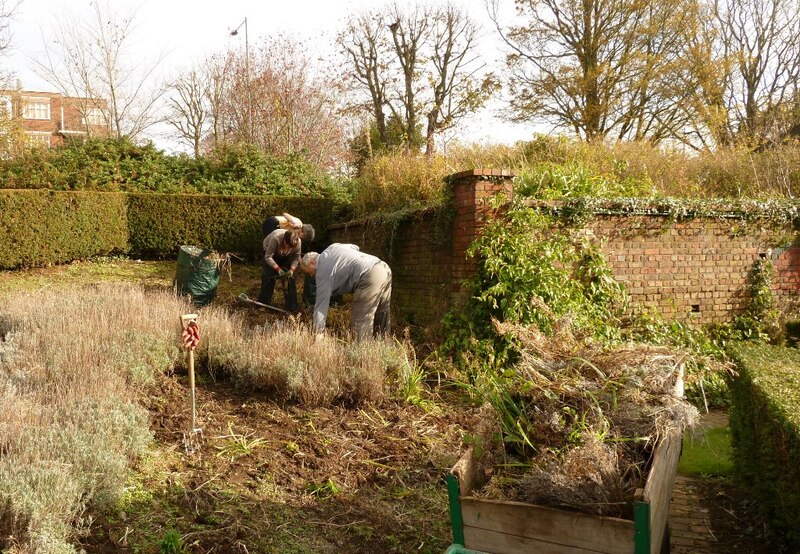 The first job has been to remove the remainder of the dead lavenders – a job begun by the monthly work party today. The next, more difficult, job is to raise money for the benches, currently priced at £921 each (although we are investigating ways of reducing this price). So – if anyone feels like funding, or part-funding, a bench to celebrate the life of a friend, there will be soon be a lovely sunny, sheltered spot in which to place it.